Before starting a registry (non-interventional study, NIS), you should be able to answer the following questions, specify the motivation of the project, and have a good idea about its supposed outcomes. Do I know why I want to perform a non-interventional study? Have its targets (endpoints, hypotheses) been clearly defined? Will the results be useful? What is the relevance of supposed outcomes for an expert medical society? Do I have adequate financial resources? Am I able to ensure that there will be enough resources to fund the project until its planned end? Am I able to address an adequate number of physicians in order to achieve the outcomes of the study? Have I ensured that the physicians would participate in the study? Development of a registry is a complex process which can be divided into three major stages. Depending on the characteristics of your registry, the duration of these stages can vary significantly; nevertheless, all of them should finally lead to an effective solution to your registry. It is important to pay particular attention to the registry design, otherwise you would end up spending a huge amount of time solving problems. 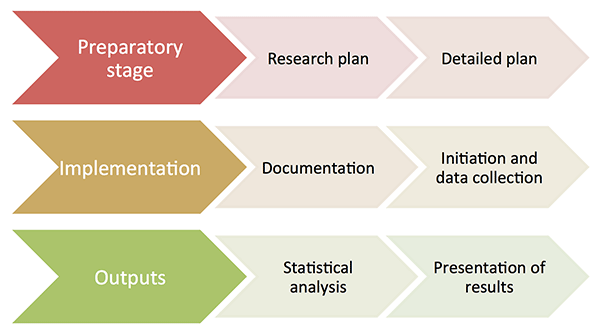 The preparatory stage involves the definition of objectives, preparation of materials for the project documentation and CRF development, definition of data collection methodology (including the technical solution of the project), planning the schedule and statistical analysis, possibly even a power analysis (estimate of the monitored sample, determination of n), negotiation with centres on their participation in the project (the selection of centres is important with regard to the project feasibility and selection bias), as well as ensuring an expert guarantee and financial resources. This stage is of key importance, defining the course of your project and having a significant impact on its success. Documentation. Defining and signing contract conditions for your project, completion of project documentation, registering the project with government authorities and other authorities if necessary (State Institute for Drug Control, Ethics Committee, Office for Personal Data Protection, etc. ), preparation of user guides (clinical, technical), checking and debugging CRF (electronic forms or paper forms), project presentation (title, logotype, website, etc.). Initiation of centres. The centres can be initiated individually (one centre at a time) or jointly (for example, at a meeting of executives from all centres). Both types of initiations have their advantages and disadvantages, and can be combined in some cases. Data collection. It is convenient to start data collection in just a few centres in order to verify the designed methodology and CRF in real clinical practice. After a short period of time (1-2 months), corrections are usually made, and the remaining centres will join the project afterwards. At this stage, it is important to keep in touch with the participating centres, providing them with feedback on how the database has grown so far, and on the time schedule of your project. The project outputs can be monitored either during its course (interim analysis) or at its end, after the termination of data collection. The outputs can be used in presentations, conference lectures, posters, or they can even serve as a source for negotiations with health care payers, for the preparation of expert recommendations, etc. Analytical centre and the main guarantor of the project are responsible for the correctness of provided outputs.